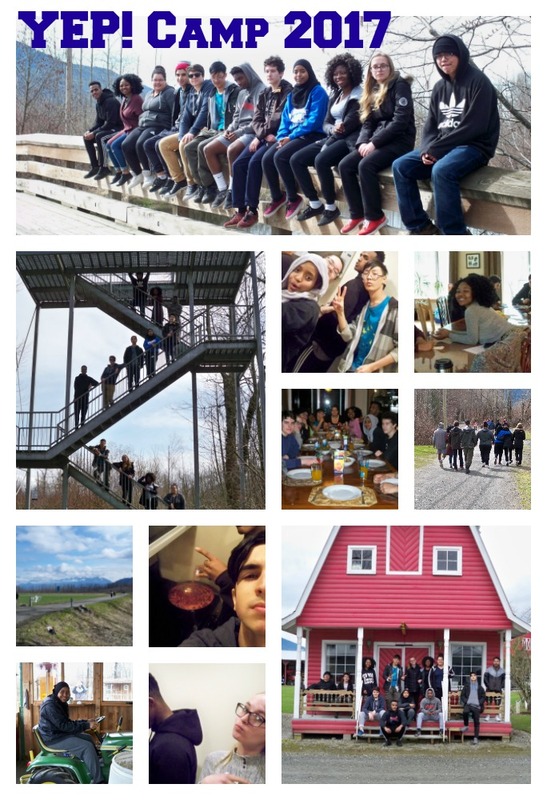 With the generous support of our friends at Coast Capital Savings, we were able to take 13 youth to the beautiful Fraser Valley for our 4th annual YEP! Spring Break retreat. The Youth Engagement Project – or YEP! to us – provides social/emotional, academic and financial support to seriously at-risk students in the inner-city. Often these students have had precarious relationships with schools and schooling, having fallen through the many cracks in the current education system, and they have struggled to find a way back in. What we offer is support in finding their way back in, and more importantly, in staying in. We create strong, healthy relationships with the students and their families, and work to develop a culture of achievement in the face of obstacles. Students commit to attending all of their classes, as well as Homework Club in the afternoons, and we commit to support their success by providing tutors for their academic needs, youth workers who understand their problems, opportunities to mentor and be mentored, and of course, our annual YEP! camp during Spring Break. This year, all but one were seasoned campers so the trip was a breeze! As soon as we arrived, they began moving furniture assigning beds, taking charge while we – the adults – sat back and wondered, “who are these kids”? We couldn’t help but think back to that first YEP! camp with 12 frightened city kids who had no idea what a fern was, let alone what to expect from their first camp experience. Those kids were frightened, confrontational, and stunned that we expected them to “go play outside”, but this bunch, the 2017 bunch, were taking charge because they couldn’t wait to get outside! 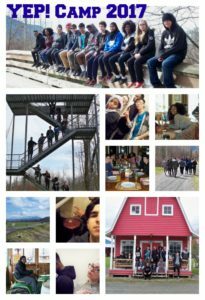 They willingly unplugged their phones, in favour of Capture the Flag (in the dark), a trip to Harrison Hot Springs and a visit to Chilliwack’s Pioneer Village. At Anita’s Organic Mill, they debated which flours would make the best dessert, and held a very civilized vote to determine whether crepes, crumbles or pies would be on the menu that night. Crepes and crumbles won, but only because we couldn’t find a pie plate. For us the experience is moving every time, but this year was something special. We were realizing a vision we had all those years ago, when we imagined that a few days in the country could make a difference to a group of young people who live precarious lives in Vancouver’s inner-city. Over the years, we have heard that the promise of camp helps them to stay motivated and keep them focused, it also provides them a much needed break from family responsibilities and the stress of urban life – a retreat in every sense of the word. We’re posting some pictures here – enjoy! Logged in as Kim SupAd. Log out?